Can a knight and his witch save seven kidnapped maidens? Sir Magnus and Elfrida strive to find the girls, but at what cost to their marriage? 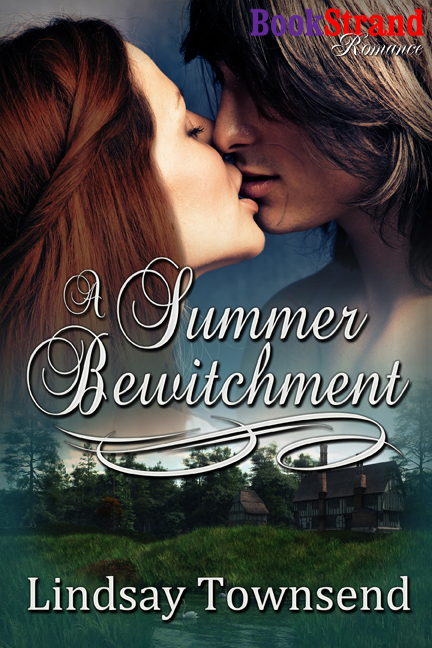 An intriguing tale, A SUMMER BEWITCHMENT, the second book in author Lindsay Townsend’s THE KNIGHT AND THE WITCH series, is a suspense-filled, sensual historical romance infused with a bit of magic. This delightful sequel to THE SNOW BRIDE can be read as a standalone, but I suggest reading the books in order. Magnus and Elfrida, despite their difference in rank, are a wonderful beauty and the beast match. The chemistry between them is scorching hot and their love for each other shines through, so I could not help rooting for them. After devouring the first novel, THE SNOW BRIDE, I was delighted to be able to re-visit these two delightful characters. Witty repartee, engaging characters, intrigue, magical spells, romance and love fill the pages, sweeping the reader up into the midst of the story. Do yourself a favor and pick up a copy of A SUMMER BEWITCHMENT. I highly recommend it! The witch, Elfrida, and her war-scarred knight, Magnus, have been married a little less than a year when some nobles arrive at their home with a request for them to find some missing girls who have been taken by a piper who wants them for his brides. One girl among the taken is a noble named Rowena, who first was destined for the nunnery and was then later chosen as a wife for a young noble. The nobles are only interested in the girl Rowena; the other girls are only peasants and not worthy of their efforts. The aristocrats are haughty, arrogant, and belittling of the lower classes. Elfrida feels their disdain for her and her confidence is shaken regarding her marriage to her knight. Will Magnus leave her because she is beneath him in class? Magnus has suffered horrible wounds from war which have left him disfigured and broken. He worries that he cannot father a child and that Elfrida will weary of him and leave him to find a man more fit to give her children. As Magnus and Elfrida struggle with their fears, the couple works to find the man who took the girls and rescue them before their sinister and manipulative capture makes them his brides. Once again, Lindsay Townsend takes the reader deep into the inner thoughts and feelings of her characters and makes the reader care deeply about what becomes of them. A Summer Bewitchment is filled with the culture of the medieval period. Ms. Townsend takes the reader on a journey into an historical world with beautifully described scenery and social norms. The deeply motivated characters become so realistic the reader will begin to feel a kinship to them as if they were friends and acquaintances. Ms. Townsend will make readers will feel Magnus’s pain when women and children run from him or scream when they see his mangled features. Even though he has every reason to despise people and become reclusive, he is so kind and gentle and filled with love for Elfrida and his human companions that the reader has to admire his character and spirit. Elfrida sees the beauty of his spirit beneath the scars and injuries and the reader will love her for her insightfulness and sensitivity. If you fell in love with this wonderful couple in the Snow Bride, you will want to see how things turn out for the knight and his witch. Ms. Townsend’s talent for creating meaningful characters will enchant you. Although the two books can stand alone, I would recommend they be read in sequence: The Snow Bride and then A Summer Bewitchment.